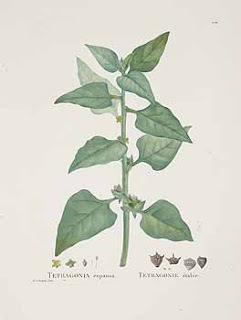 New Zealand Spinach/Tetragonia (also known as: Botany Bay spinach, Cook's cabbage,kōkihi (in Māori),sea spinach, and tetragon. Its Australian names of warrigal greens and warrigal cabbage.) Introduced to England by Captain Cook and his crew.